If you’re a bookworm you’re probably looking to create a beautiful home library that contains all your favorite books in one stylish place. Bringing your dream home library to reality isn’t an easy process if you have budget and space constraints. To help you figure out the best home library solution check out the following ideas that can provide some much-needed inspiration. If you’re short on space to build a large home library, try making use of some usually neglected places in your house. For example, the area under the stairs can be modified with custom shelving to design a unique-looking library. While most people look to large rooms to build a home library, that’s definitely not a rule. A small room can be easily transformed into a home study where an entire library of books can fit in. 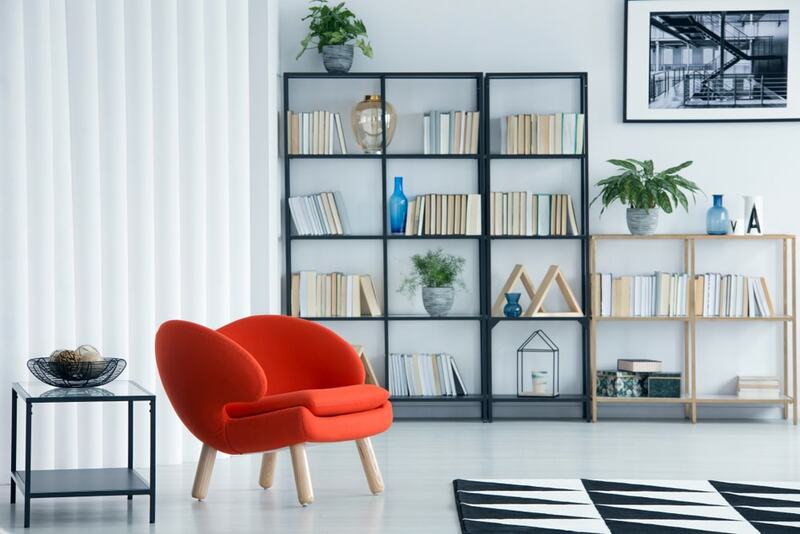 With a bit of ingenious space management like wall-mounted and built-in units, that awkward room in your home can accommodate a stylish home library. When designing a home library, it’s important to take into account including a place where you can lounge around and read in peace. 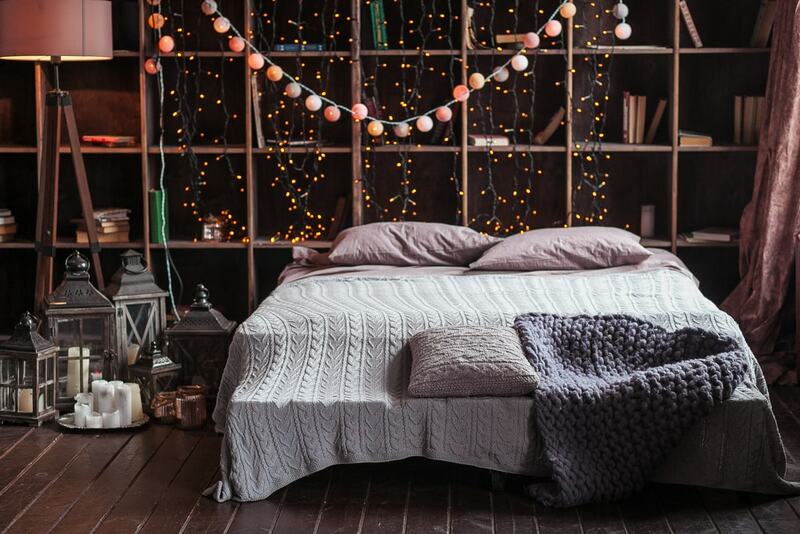 An excellent idea is to incorporate a daybed when you convert an entire wall into a library. That spot between the shelves full of books represents your cozy little space where you can enjoy reading all day long. A similar idea is to use the narrowness of a room to your own advantage. You could create a bench area between large bookcases while maintaining a well-lit environment thanks to a large window on the side. 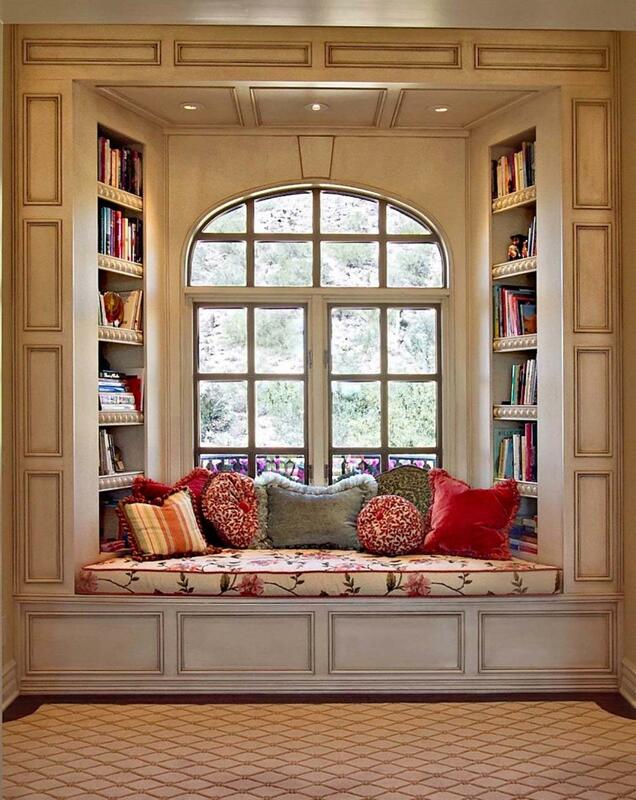 Having plenty of natural sunlight and a beautiful view contributes to getting you in the mood for reading. If you’re lucky enough to have high ceilings in your home, perhaps it would be a great idea to make the best out of that space. Adding some custom built matching shelves up to the ceiling might become impractical when it comes to retrieving books from such a tall height. There’s no need to worry though, you can make some good use of a ladder to reach even the top shelf without issues. Bookcases are great for spacious rooms, but if you plan on adding a home library in a smaller area, consider going for shelves instead. Long floating shelves can be easily anchored to the wall and store your book collection. Places like the hallway can benefit from the look of arranged books on the shelves. You can also store other essential items that you need to grab quickly when going out so this is a very practical idea. This idea works best for a part of your home library, but it’s still worth considering if you like DIY projects. 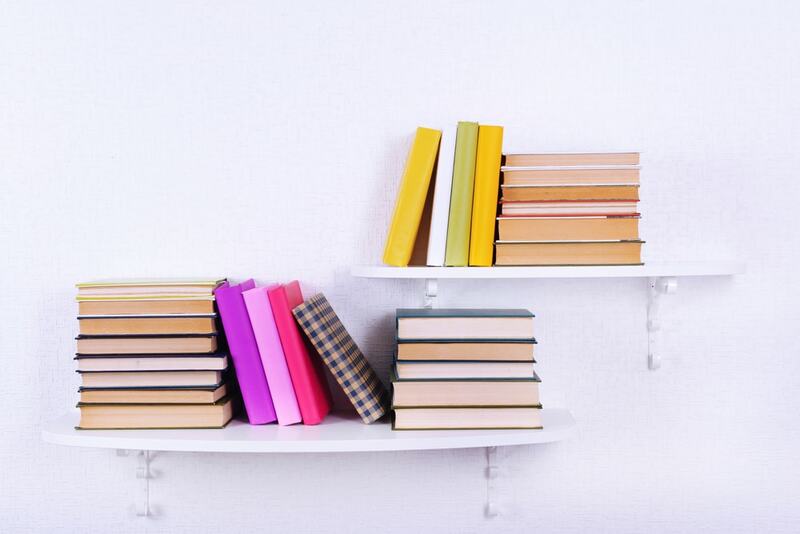 Sometimes it’s more convenient to break up books to store in multiple locations throughout a large home. A unique storage solution is to rely on wooden crates and racks. 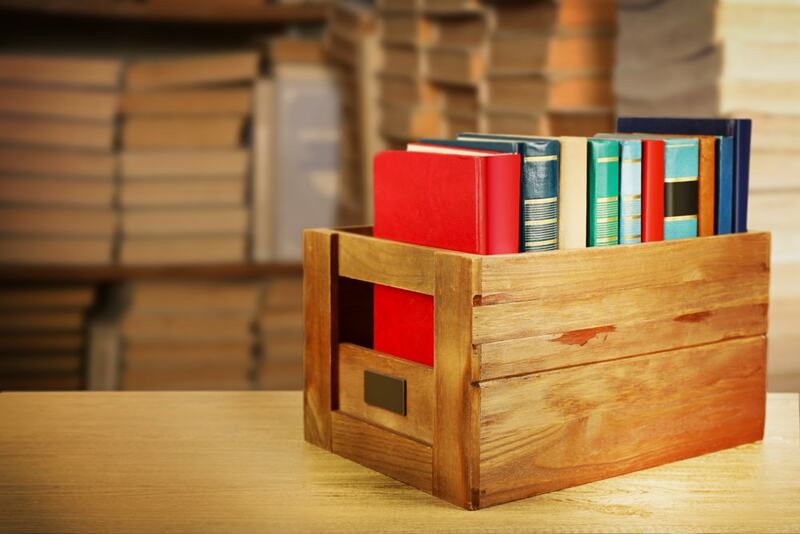 This is an inexpensive custom bookshelf that’s not very difficult to make. It can certainly provide some extra visual interest compared to a standard bookcase as you can stack crates upon crates. If your book collection isn’t that large compared to the allocated space for it, it would be a nice idea to use that free space to display other items and decorations. The key to getting this right is to ensure that any objects you showcase are organized in a harmonious way. It’s a good idea to keep things separately in a way that they don’t look out of place. 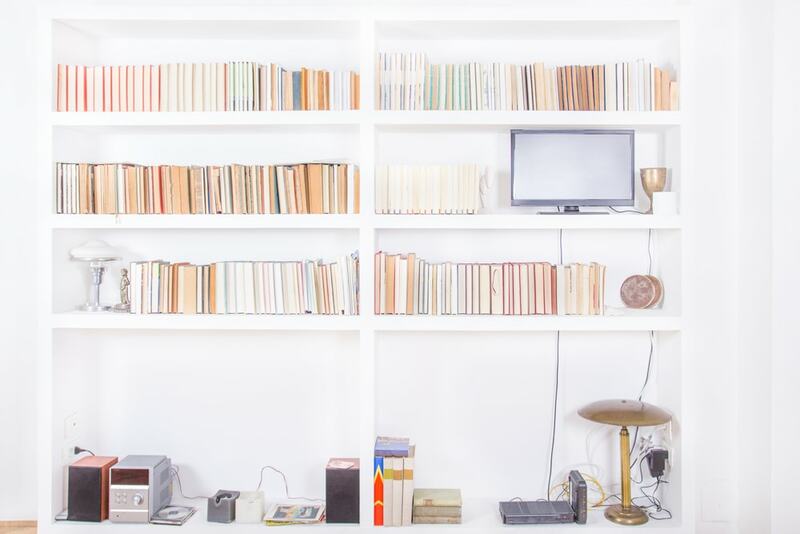 Storing some collectibles can add some much-needed visual impact to your home library. Another recommendation is to pay close attention to colors to keep the decorations balanced with the look of the books. 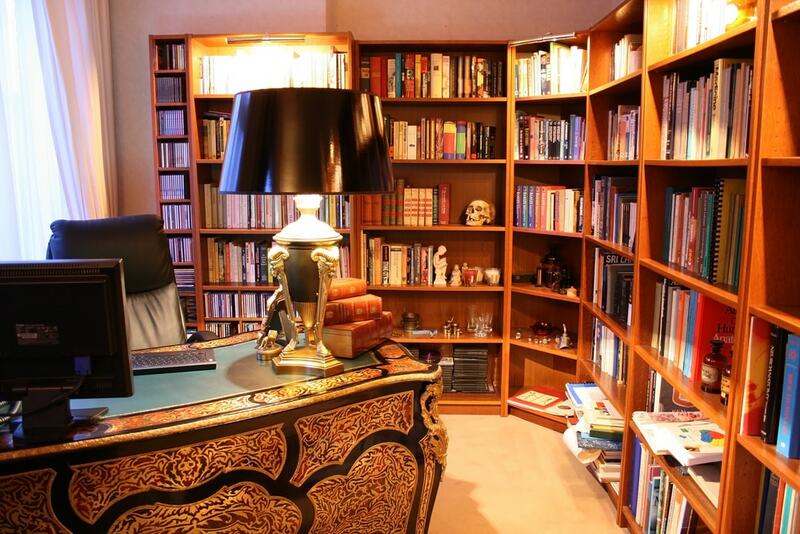 The home office is one great area to house your book collection. It’s not only great to be able to pick a book and relax after you finish your work, but there’s also the advantage of being able to display some prized possessions. This spot is usually quiet, so adding a comfy chair makes for an excellent idea to sit with a good book when it’s time for a break. While many bookworms like a simple and clean look of white bookcases, there are other options out there if you want to get more creative and make an imposing statement. Libraries may be quiet, but that doesn’t mean they should be boring. 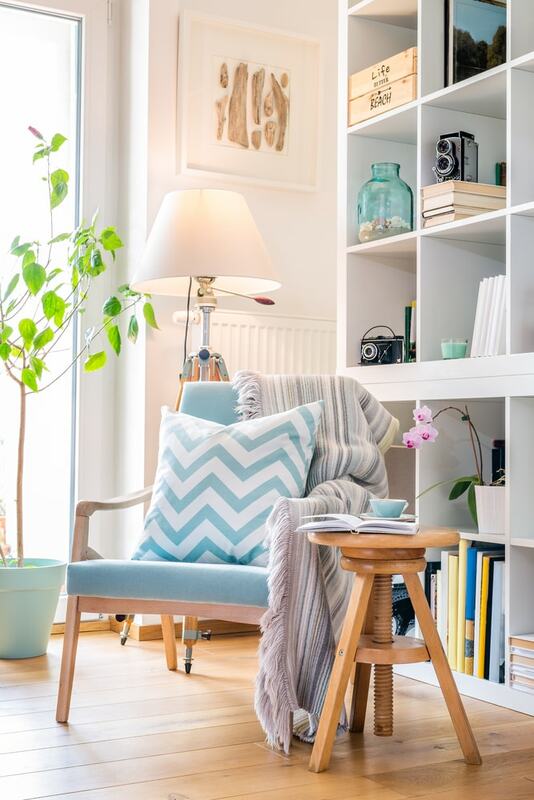 Pick something like an energizing green or calming blue if you wish for your home library to stand out from the crowd. Your books will look amazing against a bolder shade so it’s recommended to have fun with the color palette when designing your ideal home library. 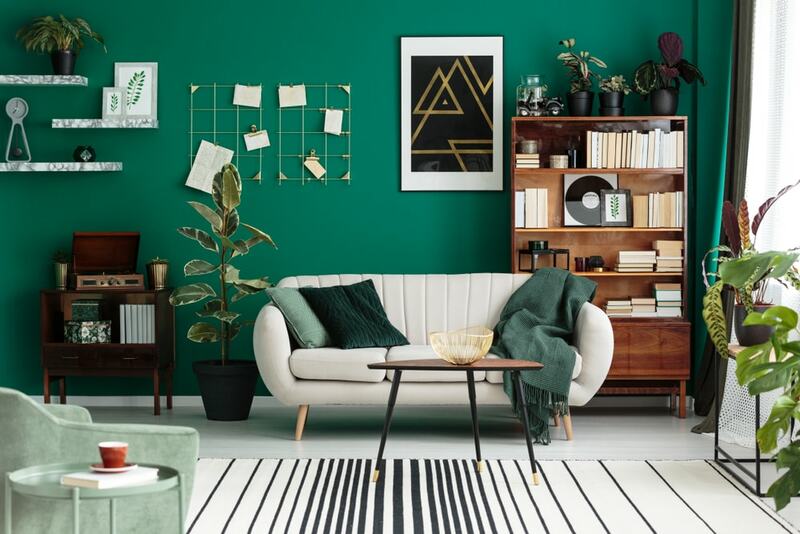 If painting your bookcases seems like too much effort, a great idea is to use vividly-colored furniture pieces in the room to add a splash of color against a white and clean library. Carefully selected elements in the room can add a new dimension to the look of your home library. 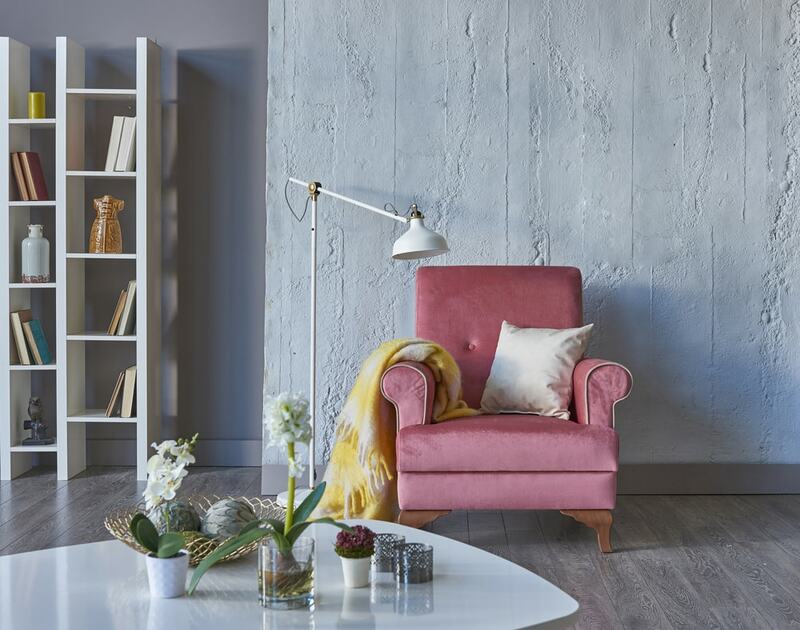 Whether it’s a brilliant violet rug or a cherry red sofa, it’s up to you to furnish and accessorize to obtain some stunning color combinations. Those who prefer a more dramatic and opulent home library should consider sticking to the classic black and white contrast. Regardless of the pieces used in the rest of the room, your book collection will look incredibly elegant if you use black bookcases against a neutral background. Sometimes a more minimalist look can be more appreciated in the modern home of a bookworm. Incorporating a television amongst the books may not suit everyone’s tastes. Even so, this represents a brilliant idea if you want to combine different entertainment forms and make better use of the available space. Your TV can have its dedicated spot while it’s being surrounded by your book collection and other stylish decorations. With a very successful integration, you can make it seem as if the television is like a framed wall art. 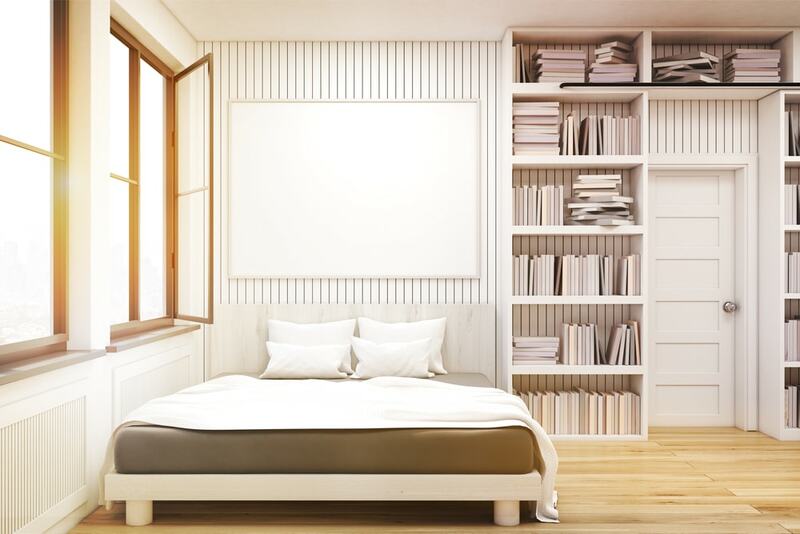 If you want a more up-to-date look for your home library, consider the current minimalism trends. 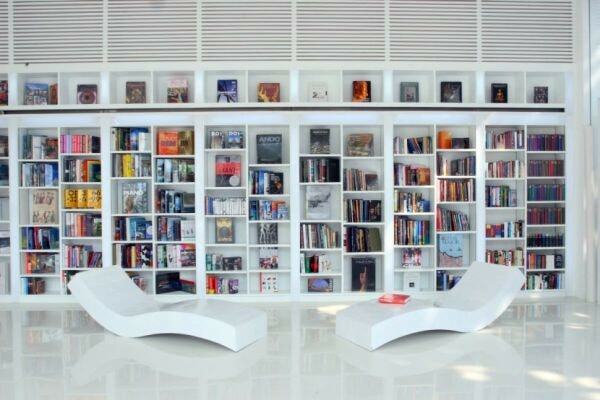 The idea is to create a space for your book collection that’s both highly functional and futuristic-looking. To achieve this kind of look, you should stick to neutral shades and add custom-built bookcases with well-defined edges and clean lines. 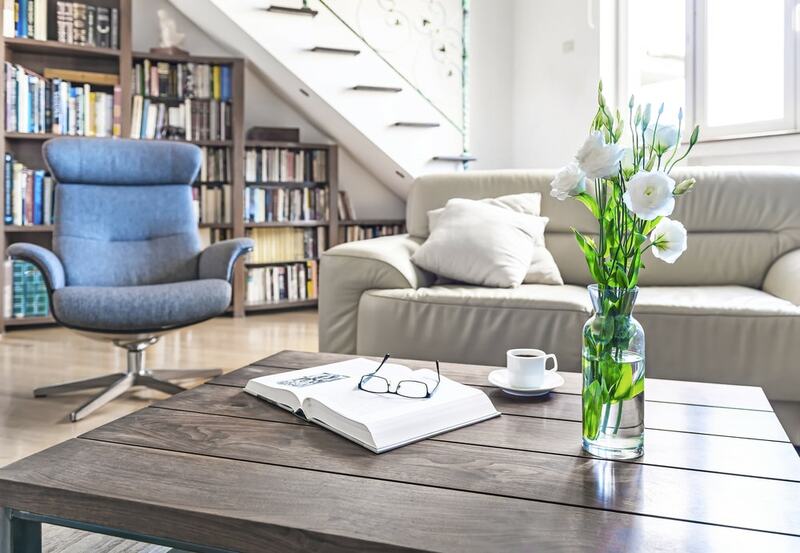 There’s no need to fully embrace minimalism in your home library design, but getting some inspiration from this trend can help you obtain some satisfying results. The area above the door is one spot where you probably didn’t think it would be ideal to store books. This is actually a great place to install bookshelves if you’re short on space. It’s recommended to combine it with adjoining walls where the bulk of your book collection is stored into bookcases. As with high ceiling ideas, you will need to get your hands on a ladder which can give you a good opportunity to integrate one as a décor element. A more unusual idea is to use vertical bookcases. Having books extending horizontally along the entire length of a room represents a classic storage solution, but this is definitely not a universal rule. Including vertical bookcases can add a unique twist to any room and they can be incorporated in multiple ways to create a stylish focal point. You could use wall-mounted shelves or just use a specific area in a wall unit. 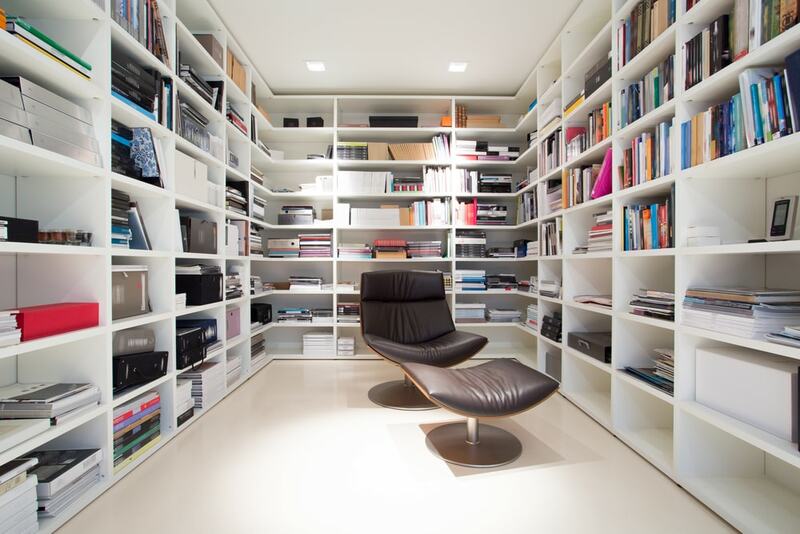 Vertical bookcases are recommended to be positioned in corners for maximum visual impact. Another idea is to take an exposed column in an industrial living space and organize a vertical library around it. A great number of bookworms enjoy reading before going to bed. If you’re one of them, it makes sense to place your book collection in your bedroom. That way, you can grab a book and return it without too much effort. 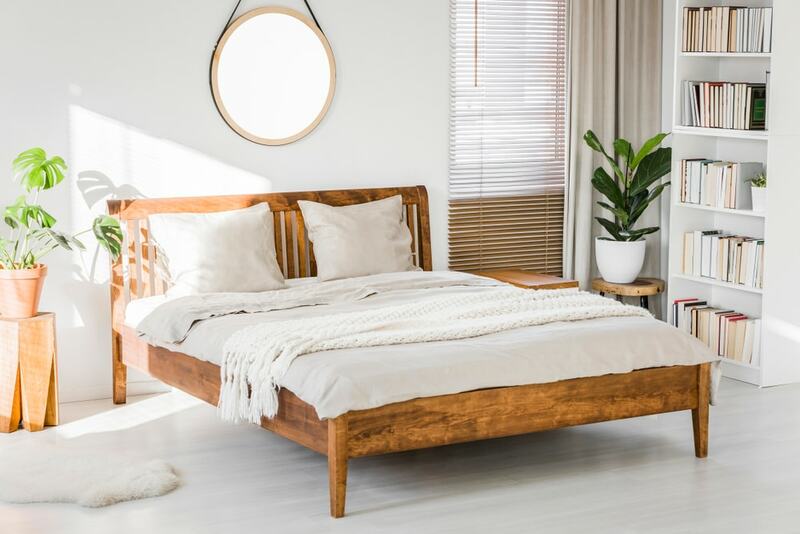 This is a very practical solution for designing a home library, especially when considering how the bedroom won’t usually require lots of furniture pieces. You should have plenty of space available to add a stylish bookcase. Avid readers know the importance of storing your books in proper conditions. 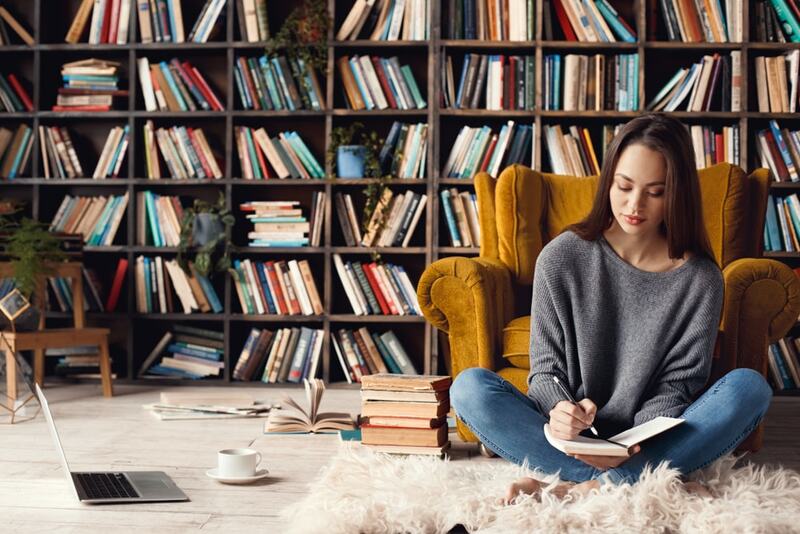 One of the most essential steps when planning for a new home library is to find the ideal spot that can house your book collection. If you can dedicate a whole room, that’s the best case scenario, but you can display your books proudly in just a part of your living room as well. 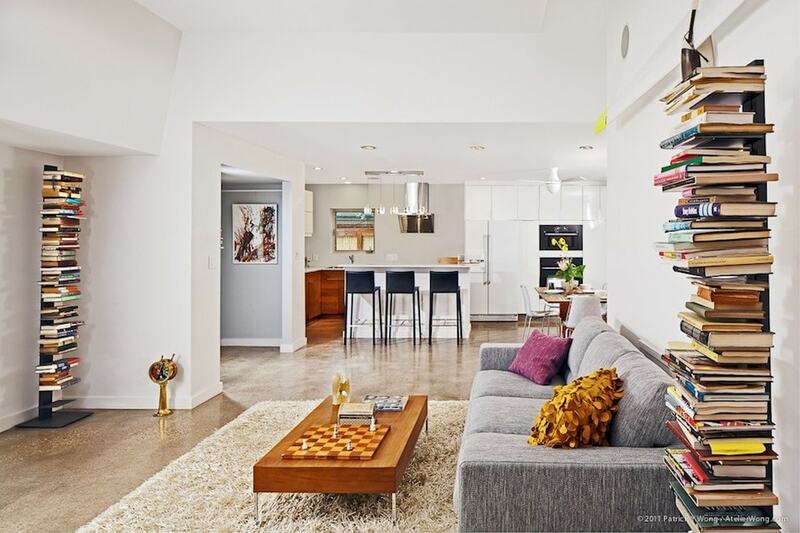 Depending on the layout of your home, you could opt for sharing space with a living area or create a dedicating reading spot from previously unused space. 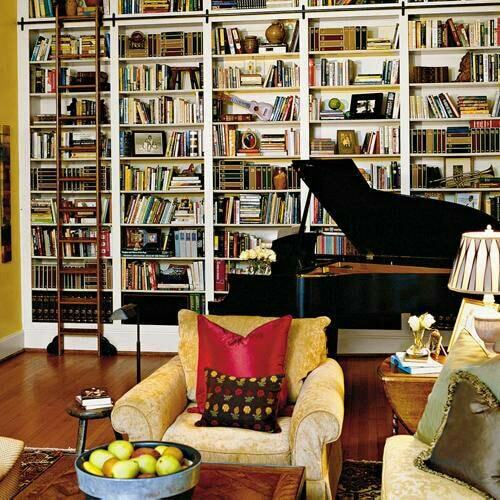 Try to be creative and picture the ideal place where you’d enjoy displaying and reading your books the most. No matter the place you select, keep in mind the space requirements to add your entire collection of books without creating a crowded feeling. 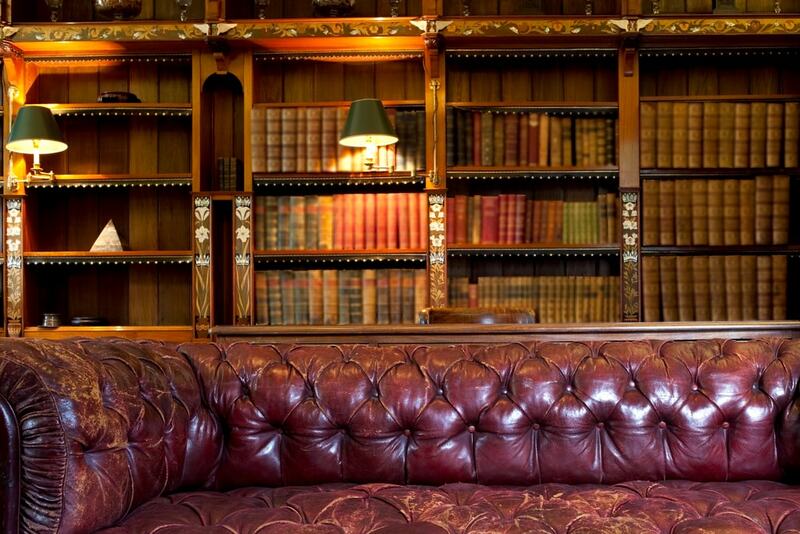 The seating is another aspect that plays a vital role when designing a home library. Comfort is key when it comes to being able to enjoy reading in peace. Dedicate enough square footage to fit in some plush pieces where you can truly relax. One comfortable chair can suffice, but you can skip the minimalist approach this time if you feel like you need some extra seating. When you have the furniture pieces in place, the next step is to decide on an optimal arrangement. The first impression that this area should deliver is a welcoming one. Consider going for a more carefree vibe by placing pieces at a slight angle. If you have two comfy chairs, it’s recommended to angle them toward each other to contribute to the inviting atmosphere. Having plenty of lighting is obviously an essential factor when it comes to reading. The lighting scheme for your home library should focus on preventing any struggles to see words clearly. Aside from a functional light that provides the critical assistance to be able to read in low-light conditions, there are other types of lighting that shouldn’t be overlooked. Ambient lighting represents a great example as it creates a more pleasant atmosphere and can get you in the right mood for some extensive reading. It’s also helpful as ambient lighting fixtures are designed to cover the entire room with warm light. Combine them with accent lighting that’s reliable when you plan on emphasizing a certain focal point. A gorgeous example is a LED picture light such as this antique brass model from Amazon. Your home library needs to feel like a sanctuary where you can sit back and relax after a long day of work and enjoy your favorite books. 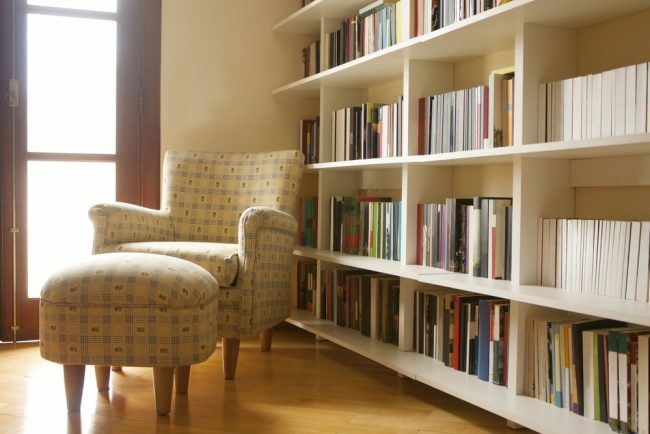 We’ve mentioned how comfy chairs and lighting layers can enrich and complete a home library. There are some other small details that you should pay attention to. Textiles can also add a new dimension of comfort to the room. From throw pillows to plush rugs and soft blankets, the idea is to make your reading space as cozier as possible. Think of hygge and how you can incorporate some of its elements here.